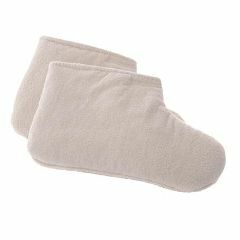 The terry velour Thinsulate boots are made of plushy terry velour and lined with Thinsulate to keep feet toasty warm. Your skin will feel so incredibly soft and silky smooth after a paraffin treatment using these boots! Toss in the washing machine for easy care. Use our paraffin liners to keep the wax inside the liner rather than getting it on the inside of the boot. One size fits all. Includes 1 pair.